It's the 15th of the month and that means it's time for another technique challenge over at SweetStamps. This months challenge, I LOVE and it's so much fun. I had so much fun with my card and love the way it came out as well. The image I am using today is called: Chalkboard. How appropriate for this weeks challenge right?!?! I edged all my patterned paper with antique linen distress ink, before sewing it all down to the Scarlet cardstock. I love this patterned paper and had tons of scrap, so I decided on creating a block card!! Love it!!! I inked the Chalkboard stamp with SweetStamps white dye ink and embossed with white embossing powder. I was planning on coloring the little figures, but decided that I loved it, just the way it stands. Awesome card! 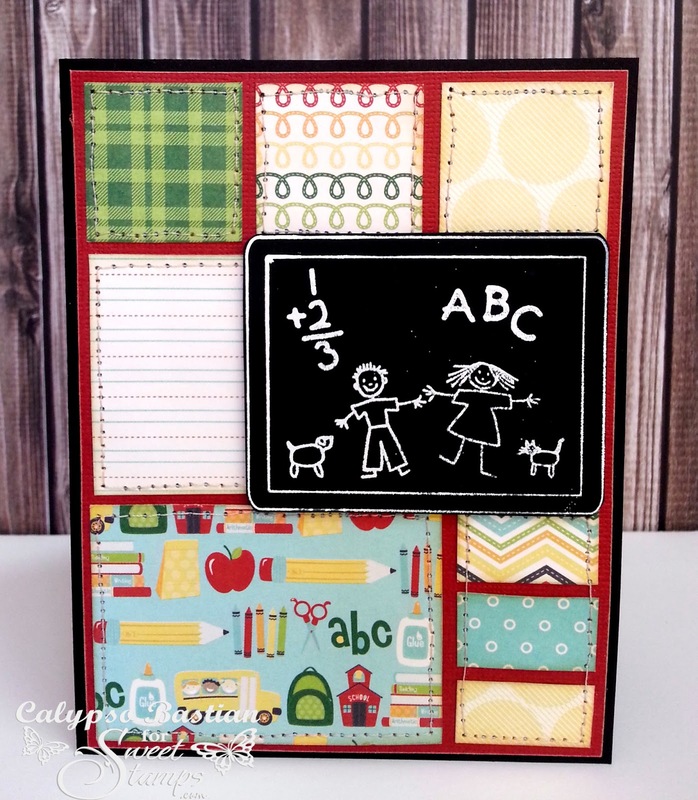 I love the sewn color blocks and school theme! Oh how fun is this for a school themed card- love the DP- which is perfect- and love the stitching!!! That image is so cute, what a great choice for the technique and it all looks great with the patchwork BG. ahhh! This is so cute! I love the stitching on here! What a cute design with the school theme for the chalkboard technique, love the added stitching on the blocks. What a lovely image! I do like the stitching on the squares! Fantastic! Love this card. The image is just too perfect.